Do you have sores in your nose? This article tells you all you’ll need to know about these sores, including what causes them and how you can get rid of them. Nose sores are fairly common. Because of their location, they are often uncomfortable and painful. It’s quite natural for you to be seeking an understanding of how they started, and how you can prevent them. The good news? The treatment for these sores isn’t at all complicated, except in rare cases, when these sores could be signs of something sinister. But that’s rare. You probably don’t need to worry about that. We’ll speak later about treatments. 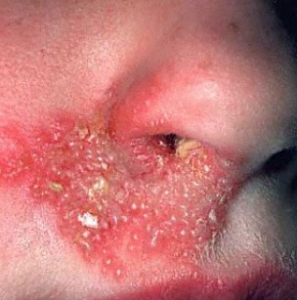 Here are some photos of sores in the nose. We’ll cover causes of these sores, and later in this article, we’ll get into treatments. If your nose is sore, it could be just one spot inside your nostril. But there are other ways it can appear. Nose ulcers, for example, are painful and progress into open wounds. You may notice them now and then, and experience recurring nose sores. This type of sore may also be as much on as in the nose, appearing around your nostrils. We may call these sores wounds or ulcers, but it’s not meant to be confusing. They are simply alternate terms for the same thing. A herpes simplex virus may cause infection and sores around your nose and mouth. They may be seen in clusters, or as single sores. They can be quite painful. Staphylococcal bacteria, in addition to other bacteria, reside in many parts of the body – nearly everywhere, in fact. Some will be found in the nose. The bacteria do not directly cause sores in the nose, but you might, if you pick at your nose, or insert objects there. Anything that dries out the nasal tissue, like cold weather, can cause the same thing. Any place where your skin is broken inside your nose, bacteria can get in, forming boils. Staphylococcal bacteria causes sores in your nostrils, since the bacteria are always there, waiting for a chance to act. If you have a compromised immune system, you’ll endure more attacks. This means you’ll have more cold sores. Sores caused by bacteria may be white in color, like boils. If they burst or are picked open, draining the fluid, they appear like ulcers located in the nose. 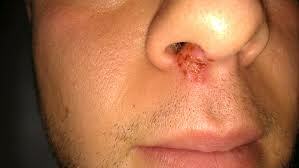 Impetigo is one example of a very common bacteria type, which causes sores in noses of children. It is very contagious and is sometimes called school sores. These are small swellings inside your nasal passages. They may be somewhat painful, and people with nasal problems like sinusitis have them more commonly. Polyps often cause pain in the nostrils like sores can. If you’re extremely sensitive to some agents found in nasal sprays, pollens and aerosol sprays, these can cause nose ulcers. If you use oxygen for extended time periods, your nose tissue will dry out, and you may have sores in your nostrils. The skin within the nose is quite delicate. If you blow your nose hard, it can break the skin, leaving a wound or lesion inside. This is an autoimmune disorder that may affect various body parts. It may cause mouth sores and hair loss. People with lupus sometimes have nose ulcers, which are commonly referred to as lupus nose sores. If the weather is dry, or you’re in an air conditioned building that has low humidity, you can get sores in your nose, since the tissue is dried out. In order to find the best nasal sore treatment, you need to know what caused it. Some sores will heal on their own, while others might persist. See a physician if you have nose sores that recur often. Nasal sores that won’t heal may be symptomatic of nasal cancer, although cancer is certainly not a common cause of sores in the nose. If you have herpes-related nose sores, your physician will usually prescribe a topical antibiotic cream. These will usually help the sores heal within a short amount of time. We suggest that you don’t tamper with sores in the nose, even the ones that look like zits, which you may want to pop. If the sores get too painful, begin bleeding or don’t clear up within several days, see your physician. This isn’t easy, especially if picking at sores is a habit. Do it as little as you can, to avoid potential breaking of the skin. If you must touch the area inside the nose, be sure you have clean hands. Even if you have a cold or sinus infection, don’t blow your nose too hard. Otherwise you can tear the delicate tissue inside your nose. Go slow with nasal spray. Using nasal sprays in the long term can cause a drying out and cracking of the membranes in your nose. Avoid using sprays for a prolonged period of time. Wash your nose out, in case you have exposed yourself to allergens. If you use oxygen, ask your physician about a gentle lubricant you can use to ease dryness. Cold compresses won’t treat those sores in your nose, particularly if they were caused by an infection. However, they will relieve the pain and inflammation. It’s easy, too. Just soak a clean cloth in ice water. Squeeze out the excess water and then place the cloth against your nose, above the redness and soreness. You can also wrap a single ice cube in a clean cloth and roll it around against your nose. Whether you use cold water or ice, it will offer you welcome relief. Next articleWhat Happens After a Miscarriage?